The 2019 spring garage sale is Saturday, May 4th. Photo credit: Lesley Van Winkle. It's getting to be the time of year to go through your closets, clean out the garage and think about what you don't need anymore and could sell at the semiannual Mill Creek garage sale. Here in 2019, the spring garage sale is Saturday, May 4th. As most people already know, Mill Creek's semi-annual garage sale is always held on the first Saturday in May and the first Saturday in October. Anybody living in Mill Creek can have a garage sale on this day, there is no map and no sign-up is required. This is a citywide sale, just open your garage doors and people will come. You can expect thousands of bargain hunters from all over the State and even visitors from as far away as Oregon and Canada. Everybody loves a bargain! Sales usually begin around 8:00 am and the roads can be congested. In years gone by the Mill Creek City Police had assigned officers in neighborhoods directing traffic, but now on-duty officers proactively patrol the event to respond to traffic issues as appropriate. Please be sure to allow plenty of extra time if you need to get your car out during the sale. 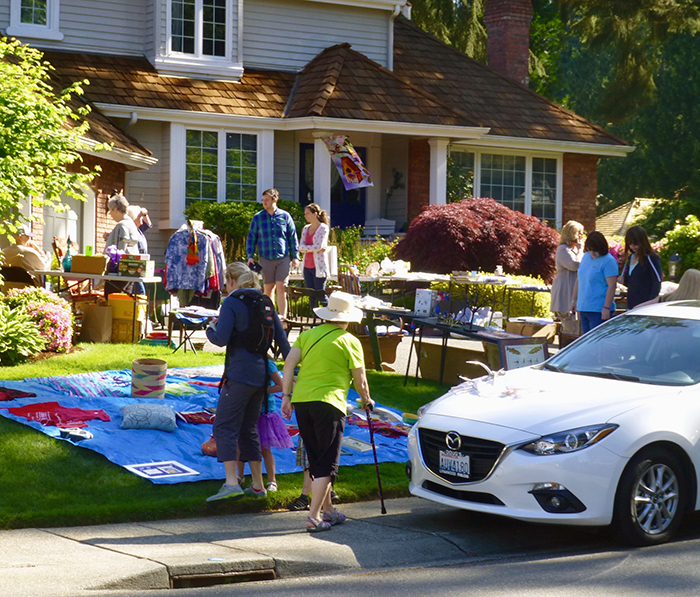 The Mill Creek Garage Sale has been running for over 30 years and was originally started by the Mill Creek Community Association but now has a life of its own. Thousands of residents look forward to this event as a great opportunity to get rid of everything they no longer have a need for and at the same time make a bit of cash. Other residents plan on staying inside their home for the day or leaving town to get away from the crowds and the traffic. The Goodwill Trailer will be located in the Mill Creek Community Association Office parking lot to accept donations of items you wish to donate or do not sell. Sunday: 9:00 am to 5:00 pm. If you miss these times there is a Goodwill donation location near Martha Lake at 710 164th St, SW, Lynnwood, WA 98087. Hours are: Monday to Sunday, 9:00 am to 8:00 pm.